The “IV House” TM is another example of a simple medical innovation —born of necessity —which enhances patient safety and comfort, minimizes labor, leads to more consistent IV fluid injection and reduces preventable medical accidents and errors. After years of watching nurses painstakingly construct makeshift IV covers, one at a time, from cut-up plastic cups and tape, pediatric nurse Lisa Vallino, RN, BSN, decided there had to be a better way. So in 1992, she and her mother and business partner Betty Rozier approached a plastics manufacturer who helped them develop a U-shaped, domed cup, which they dubbed “I.V. House”TM. The I.V. House quickly became a staple in some of the major local pediatric hospitals like St. Louis Children’s Hospital. 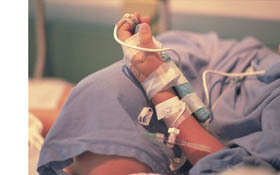 The computer-mouse shaped, polyethylene shield covers the site on a patient where an intravenous needle has been inserted. The IV House prevents the needle from being accidentally dislodged, minimizes the exposure to patient tampering and usually results in longer dwell times. The resulting benefits range from patient comfort and hospital labor savings to prevention of potentially life threatening blockage of medication. Betty Rozier and Lisa Vallino received the patent for the IV House in 1993. Vallino and Rozier next sought out commercial and design partners to help take the original I.V. House to the next level. Today, the tape-free I.V. House UltraDressingTM is the next generation of the product. It not only prolongs dwell times and eliminates the need for restarts, but also lowers the costs of healthcare and eliminates the potential for some medical errors. Users recognize it as an important step forward in the practice of atraumatic care and patient satisfaction.